Present state: Station building extant in use as a private dwelling. Platforms demolished. 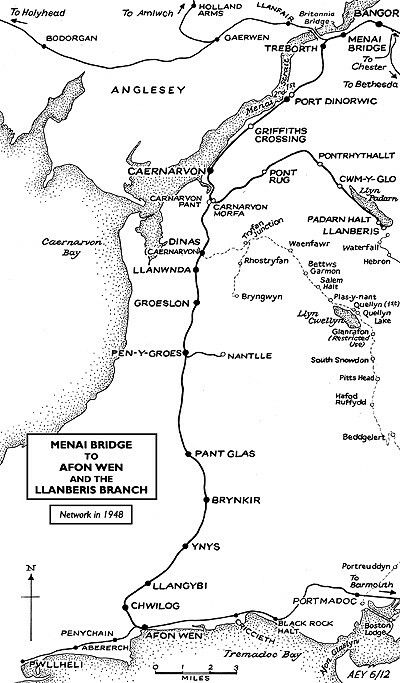 Notes: Llangybi was situated on the Menai Bridge – Afon Wen line which opened in stages between 1852 and 1871. On 29 July 1862 the Carnarvonshire Railway (CR) was authorised to build a line between Caernarfon and Afon Wen and by October 1866 it was mostly complete and was inspected, but its opening was not approved until 2 September 1867 by which time all work was finished. 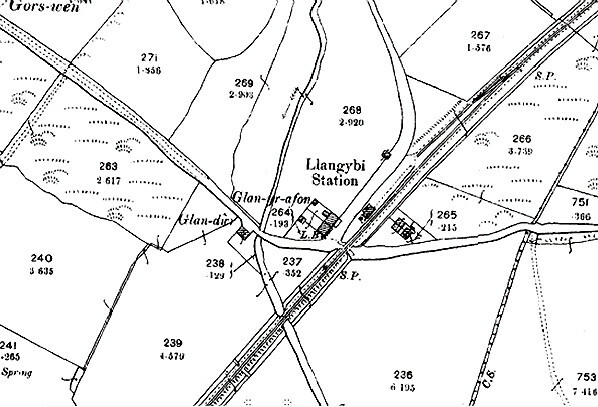 Llangybi was in an isolated location and did not open with the line. There was a level crossing at the location, and from March 1869 trains picked up passengers for fairs and markets only. It is unlikely that there were any facilities at Llangybi at this time. On 4 July 1870 the CR had become part of the London & North Western Railway (LNWR). From October 1870 Llangybi was shown in the Bradshaw timetable as having trains on Tuesdays only; by January 1872 it had services every day. A single-storey stone building and a platform were provided on the north side of the level crossing, west of the line. The building had a booking and parcels office. The platform was to the north of the building and had a timber face backfilled with cinders. The station was also provided with a siding on the west side of the line, north of the station. Accommodation in the form of two cottages was provided for staff on the east side of the line. between Bangor and Afon Wen with some trains continuing beyond Afon Wen. By December 1895 Llangybi had five up and five down trains on weekdays with an extra train in each direction on Mondays. There was also one train in each direction on Sundays. In 1915 a passing loop was installed at Llangybi and an extra platform was provided; the new line was located to the east of the original. The original line and platform became the ‘up’ direction (Menai Bridge) and the new the ‘down’ (Afon Wen). A timber waiting shelter, which contained a ladies’ waiting room, was provided on the up platform. A barrow crossing at the south end of the station connected the platforms. The down home signal was on the down platform, north of the crossing, to protect it while passengers were using it. 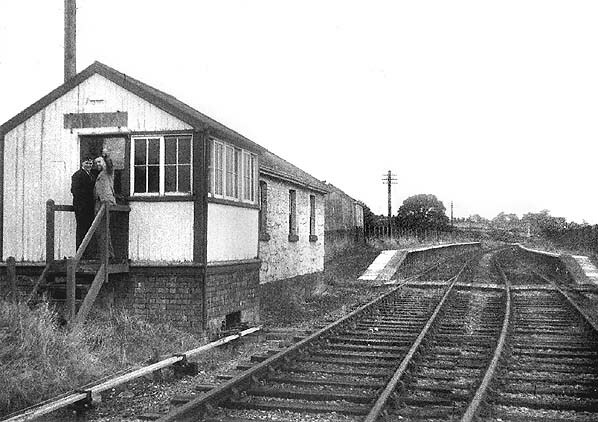 South of the original station building, on the west side of the line, was the small timber signal box which controlled the passing loop at Llangybi. It was a standard LNWR box with a 15-lever frame, but it measured only 12 x 12ft and stood only 8ft 6in above the ground. The token exchange equipment was installed in the original station building. By July 1922 there were seven up and five down trains Monday-to-Saturday as seen in the table below. There were no Sunday trains. On 1 January 1923 Llangybi became part of the London Midland & Scottish Railway (LMS). By 1928 they were running nine up and seven down trains. The service was the same in the summer of 1932. In 1938 the siding at Llangybi was taken out of use and lifted. extended, and the platforms were rebuilt with prefabricated concrete sections. On 1 January 1948 Llangybi became part of the British Railways London Midland Region. The summer 1948 timetable showed seven up and seven down trains Monday-to-Saturday as shown in the table below. 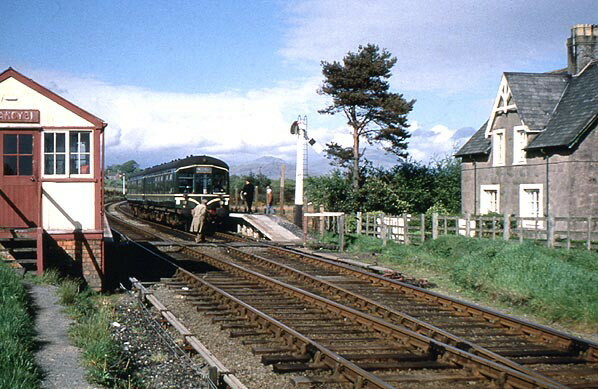 By the mid 1950s the line through Llangybi was very busy during the summer months especially on Saturdays when a number of extra services ran to and from Penychain. 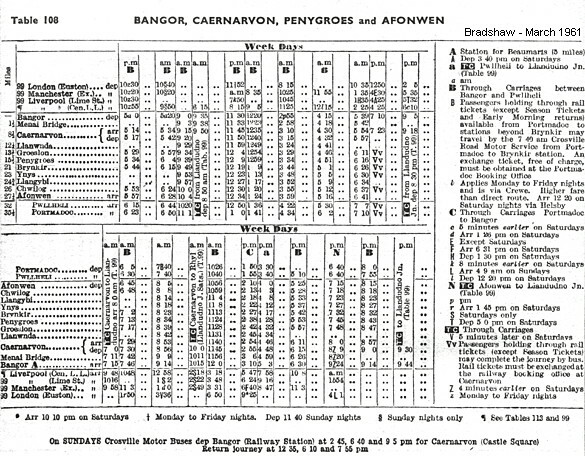 Most of the trains passed through Llangybi the summer timetable for 1960 showed only eight up and six down trains called to pick up passengers on Monday-to-Saturday as seen in the table below. 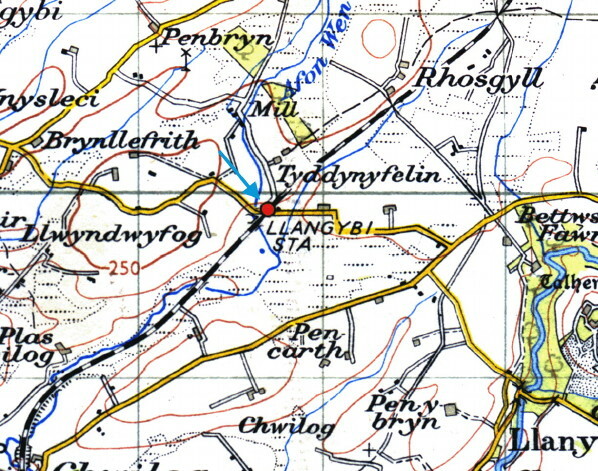 The line through Llangybi was not lifted immediately, and track was still in situ in 1968. 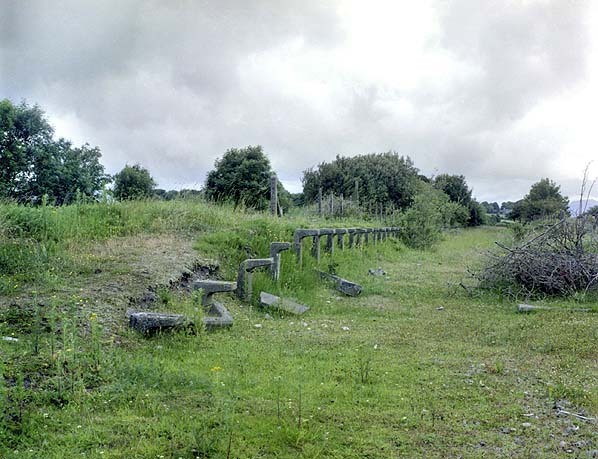 The station platforms survived in a derelict condition until the early 1980s. In May 2012 the original station building was extant and used as a private dwelling, as were the railway cottages. Llangybi looking north-east from a southbound train that had just departed from the station in June 1956. A 'Derby Lightweight' DMU can be seen standing at the up platform. It would have arrived at Llangybi at about the same time as the southbound train. Single line tokens would then have been exchanged allowing both trains to continue on their journeys. The down platform at Llangybi in June 1956. Looking south-west at Llangybi stayion from the north-east end of the down platform in the early 1960s. 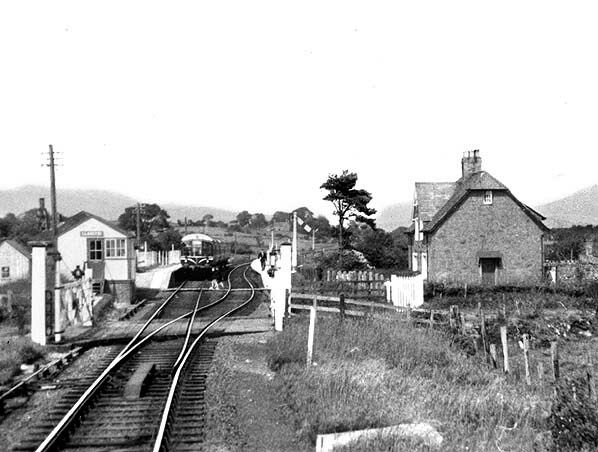 Llangybi station looking north-east on 22 May 1962. A 'Derby Lighweight' DMU is seen standing at the down platform with a Pwhelli service. A passenger is cautiously crossing the line to join the train. 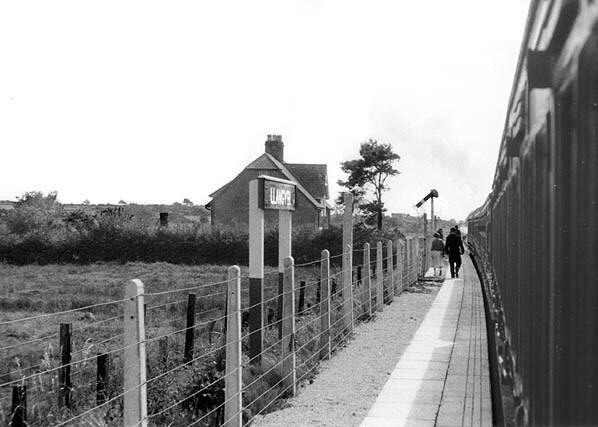 Looking north-east from a DMU as it departs from Llangybi station in 1964. 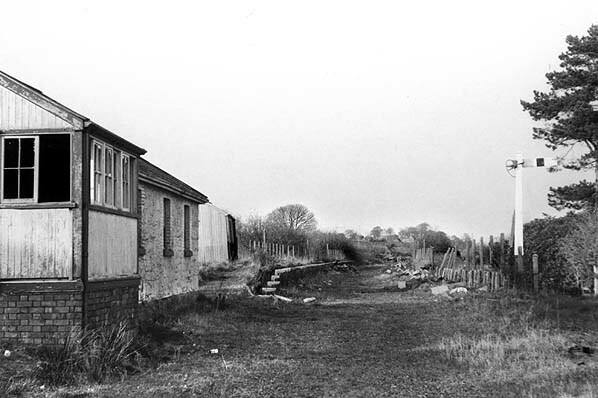 Llangybi station after closure in 1965. 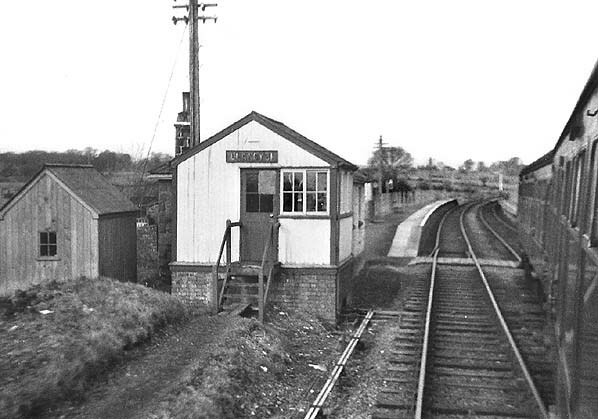 The signal box that controlled the passing loop and the level crossing is seen to the left. 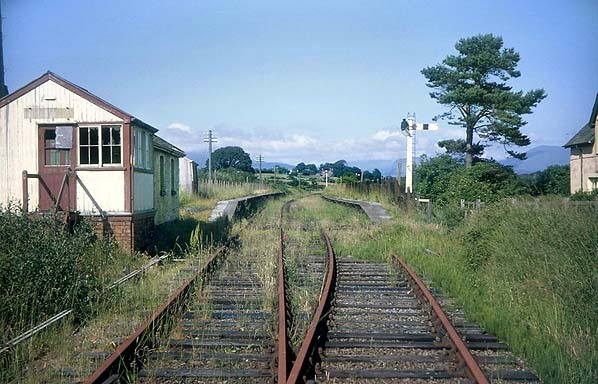 Looking north-east at Llangybi station in the summer of 1968. All of the station facilities were still present nearly four years after closure. 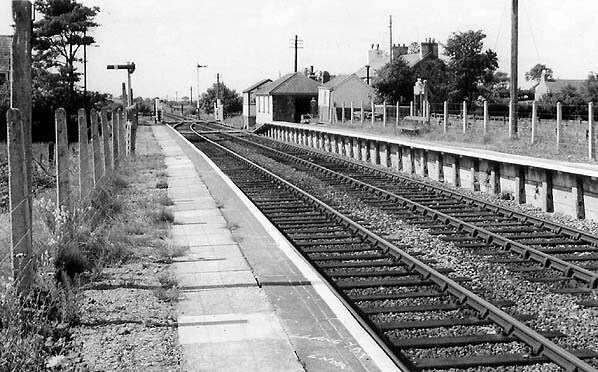 In this view looking south-west in the early 1970s the platforms at Llangybi had been partially dismantled. The buildings were still standing though and the down home signal was still in place. 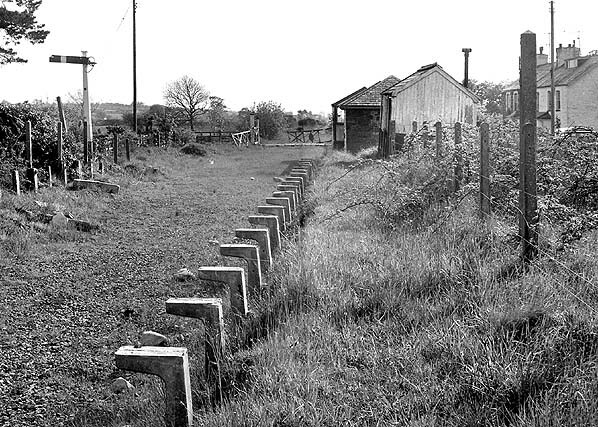 The remains of the up platform at Llangybi looking north-east in May 1979. Llangybi station seen from the site of the level crossing on 25 May 2012. The building to the left is the original station booking office. It had been extended after closure and in 2012 was in use as a residential property.